Prayer can very often be a last resort. Once everything you can imagine has gone wrong, you've lost your job, your car broke down, you've put on half a stone and your favourite pair of suede Jimmy Choos are floating in a pool of your own tears that's when you call on God for help. We've all been there (well only some people are lucky enough to own Jimmy Choos -I'm not one of them) and we've all done it. We have all used God as a last resort once we've tried to fix it all on our own steam believing we are strong enough and capable enough to take on life independently. Or we convince ourselves that God doesn't need to know about the little details that he's only interested in the big spiritual stuff. Some of us choose to ask every friend, relative and stranger on the bus what they think of your dilemma and how best to fix it. And I am not saying these things are all terrible and wrong seeking advice can be a great thing to do but only after seeking advice from the Lord. We can often forget that God knows us so intimately it says in Psalm 139 that he "knitted me together in my mothers womb" (ESV) he knew us way before we were even conceived, way before we were born. He knows every tiny little particle of us and loves each one so completely. So why then do we think that he wouldn't be bothered by the small trifles of every day life? Why do we think it would be better to do it alone or to do it with another. He knows us better than even we know ourselves and he knows exactly what we need. Now I am not saying that we should pray and God will gives us exactly what we want because he doesn't always do that, sometimes its more subtle like a push in the right direction or the strength to do something we couldn't do on our own or even putting a particular person in our lives to help. Or alternatively he may not give us anything except comfort and love because he knows what is best. In 1 Thessalonians 5:17 Paul tells us to "Pray without ceasing" and again in Philippians 4:6 it tells us to "not be anxious about anything, but in everything by prayer and supplication with thanksgiving let your requests be made known to God." we are told repeatedly that God wants us to be in continual conversation with him. It doesn't say when you are fighting a huge great big spiritual battle go and pray instead it says not to be anxious and to bring everything to God so that we can be filled with his peace. We have an amazing and loving father who cares about us so much and he wants to hear about our anxieties, worries and problems so that we can give them to him and have the burden lifted. Firstly I would suggest praying about the little things, get into the habit of asking God on a daily basis for help so you get used to relying on his strength and not yours, for example when I am tired and driving home from somewhere I ask for his help to concentrate and stay safe. Or before a lecture at uni I will ask him to help me keep my focus and contribute. Little things like that make a big difference. 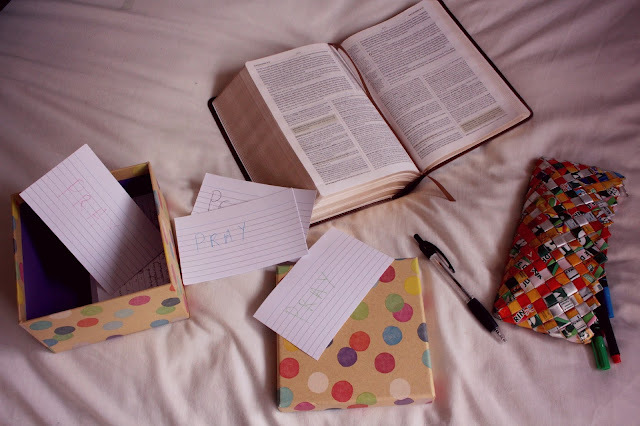 Secondly this may sound silly but get yourself a big piece of paper and write "Pray First" on it then stick it on your wall. This really helps to remind me everyday getting in and out of bed that I need to pray first whatever I am doing. You can even get a bit crafty and make a pretty one with glitter! I hope you're all having a good day and please do let me know in the comments what you think and if this has helped you. God bless!